I really didn't know how important color is until today's bleak scenery showed me. The art of color blocking is perfected by this lovely redhead. Her red polka dotted pants are rolled up to ankle length, revealing her amazing multicolor polka dotted sneakers. 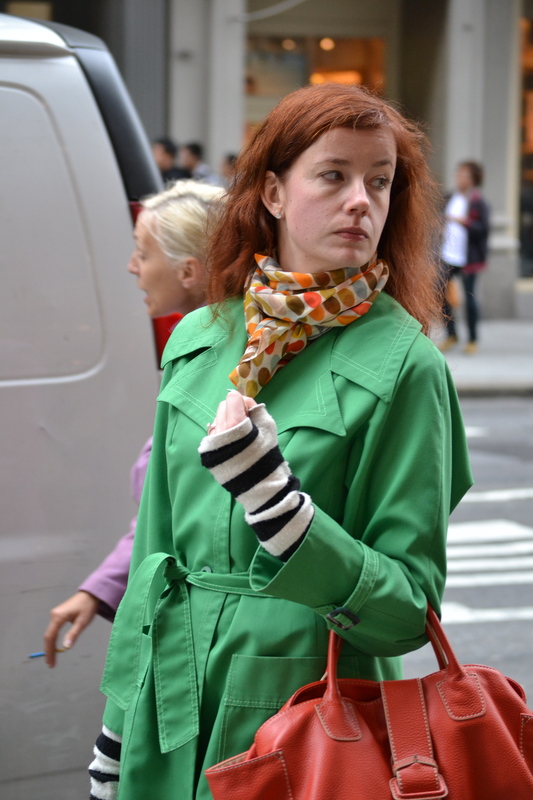 Her green belted trench and bright orange handbag are the only two solid color items in the ensemble. Her black and white striped, fingerless gloves add the only strong lines on the outfit, but the scarf ties right into the polka dot motif. Posted on April 23, 2012 by Capture the Streets	This entry was posted in Fashion From the Streets and tagged Color, fashion, New York City, photography, style, Women's Fashion. Bookmark the permalink.